Current and former Yasuda employees accused the restaurant of "stiffing them on training wages, tips, and overtime." Emblematic midtown sushi temple Sushi Yasuda made headlines last year when it eliminated gratuities and switched to a Japanese-style no tipping policy. 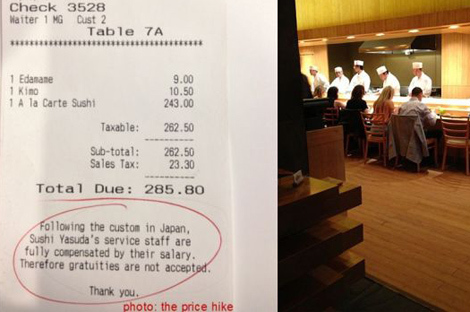 Instead of relying on tips, all Sushi Yasuda servers were purportedly on salary with paid vacation and sick leave. But according to online legal news outlet Law360, current and former Sushi Yasuda employees filed a wage-and-hour class action lawsuit this year against the restaurant, accusing the management of “stiffing them on training wages, tips, and overtime.” The restaurant has agreed to pay $2.4 million to settle the class action. According to Law360, employees said in their suit that despite receiving several hundred dollars in tips per shift, they were required to hand over gratuities to a shift manager. If the allegations are true, it appears that the restaurant had a “we take your tips” policy before it officially adopted a no-tipping policy. Any sushi chef, busser, or wait staff employee who worked for Sushi Yasuda for 90 or more days between Dec. 3, 2006, and May 12, 2013, is eligible for a share of the settlement, according to the agreement. “That they settled for $2.4 million means their real liability was way higher,” says labor and employment lawyer Jason Campbell. Will the Yasuda suit discourage other NYC restaurants from banning tipping and moving towards paying employees a livable salary and benefits package? It very well could.